OK guys I was out of distilled water and my car battery was kind of low on it. What to do, what to do? in this sweltering heat, I mean it was 45 C. So I hopped in to my car and drove to the nearest gas station which happened to be 5 km away. Shoot! they were out of it too! That’s when I remembered, I have endless supply of distilled water in my very home. Well if is summers then you are in luck. 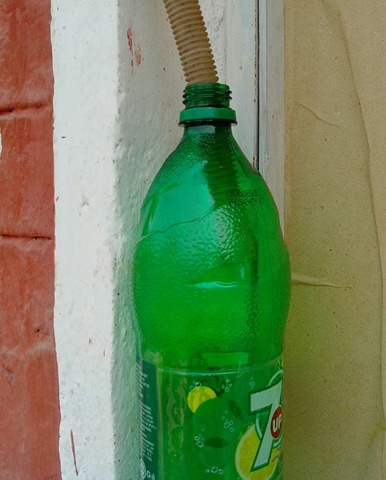 Just hold a clean empty bottle under the air conditioner’s hose that is meant to let out condensed water. That’s it, free distilled water for your batteries. But please do not drink it. On the other hand, you can also use rainwater. The best natural distillation process. 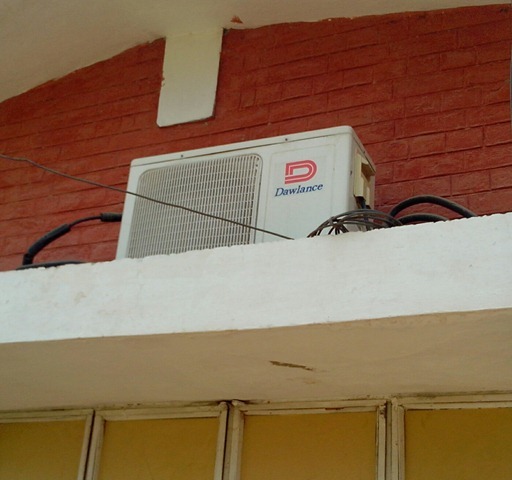 This is the air conditioner, I have attached a bottle to the over flow pipe. But please remove the bottle as soon as it fills up or you are going to have an overflow in your room! PreviousCheering up the Chinese Janitor!